At the Beijing Olympics, China proved it was best in the world at coming in first. Now the country will show it can also be very happy with bronze. Later this week, 43 years after cosmonaut Alexei Leonov spent 12 minutes outside an orbiting spacecraft, China plans to become the third nation after the Soviet Union and the U.S. to conduct its own spacewalk. The feat would be both a technological and public relations triumph. "Beijing is signaling to the rest of world that it is a first-rank space power," says Dean Cheng, China analyst with the CNA Corp., a U.S.-based think tank. "It is capable of doing things only the U.S. and Soviet Union have done. It is ahead of Japan and the European Space Agency in terms of space flight." On Sept. 25, the Shenzhou VII is scheduled to launch from the Jiuquan Satellite Launch Center in western Gansu province in prime time between 9:07p.m. and 10:27 p.m. The mission will be the country's first to carry three astronauts  or hangtianyuan, as they are called in Chinese  into orbit. 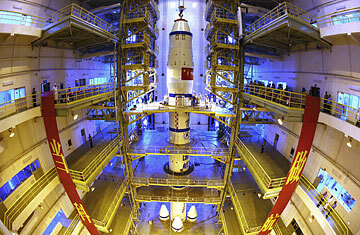 The spacecraft, a modified version of the Russian Soyuz vessel, will carry a Russian and a Chinese-designed space suit. "This is big," says Joan Johnson-Freese, an expert on the Chinese space program at the Naval War College in Newport, Rhode Island. "It's not easy to design a space suit that's flexible and has life support." At a time when the reputation of "Made in China" is once again being battered by a product safety scandal  this time chemical-tainted milk  China will see a successful space mission as a welcome fall extension of its Summer Olympic glory. "When combined with a successful Olympics, it becomes very difficult for China to be [seen] as a developing country," says Yan Xuetong, director of the Institute of International Studies at Tsinghua University in Beijing. "With the huge amount of money spent and the high-tech capacity, the two things will make the world believe that China is a developed country, not a developing country." That powerful propaganda is not just meant for overseas consumption. It also says to Chinese that "there are problems, yes, but the message of this is that the Party has right control policy because of all it has done," says Cheng. "It hosted the Olympics, it put Chinese into space and made China a first-ranked space power." The prestige that comes from a national space program are clear, says Li Jing, a retired Chinese Academy of Science astronomer. "Chinese people of my age have a lot of feeling towards former President Kennedy. Why? Because the Apollo project catapulted the U.S. into a scientific leader," he says. Like America during the last space race, China could expect a space program would lead to job creation in high-tech fields, dual use technology that can have military applications and heightening interest among students in math and science fields. "The Chinese have read the Apollo playbook," says Johnson-Freese. "They understand everything the U.S. got from lunar program." China has yet to declare a plan to put an astronaut on the moon. But that is the ultimate goal of the steps its program has been taking, says Johnson-Freese. On October 15 and 16, 2003, Chinese astronaut Yang Liwei completed 14 orbits of the earth in Shenzhou V, making China the third nation after the U.S.S.R. and the U.S. to put a human into space independently. Two years later Shenzhou VI carried two Chinese astronauts into space. This week's Shenzhou VII spacewalk is part of preparations for constructing a Chinese space lab. Subsequent flights would carry up the lab components, though Johnson-Freese notes that if China want to launch a larger vehicle, like a space station, or send a manned flight to the moon, it needs to develop a heavy lift launch rocket, which could take up to a decade. Last fall China launched the unmanned Chang'e lunar probe. The next steps for the lunar program are a soft landing with a moon rover slated for 2012 and launching another rover and returning with samples in 2017. While there have been declarations by some space officials of when China could put a man on the moon  Ouyang Ziyuan, the chief scientist of China's Chang'e lunar probe, once said 2017; the deputy head of the Shenzhou program said 2020  there is no official timetable. The U.S., the only nation to land astronauts on the moon, says it hopes to return by 2020. But it may be racing China for the silver medal.